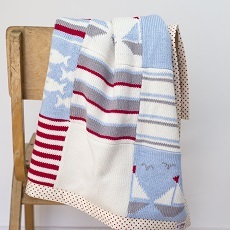 A contemporary knitted baby blanket featuring sailing boat motifs. Beautiful handmade patchwork blanket for babies, integrating 12 individually knitted squares featuring sailing boat motifs, fish and a variety of stripes. Knitted in pale blue, bright red, cream and taupe. The knitted blanket is backed in a cream fabric with red printed spots. All Smitten baby blankets are lightly padded for extra warmth. This patchwork blanket has been created using Smitten’s distinctive style; combining knitted and woven textures, to provide a contemporary twist to traditional baby essentials. All Smitten patchwork blankets are knitted in sumptuously soft ‘Baby Bamboo’ yarn (80% bamboo 20% wool) developed especially for babies by UK based yarn spinner, Sirdar. The wool content adds warmth to the yarn whilst the eco friendly bamboo fibres give it a super soft and gentle handle. Perfect for snuggling against babies’ skin. Smitten patchwork blankets are approximately 65cm width x 70cm height. Perfectly sized for use in the Moses basket, cot or out and about in the pram.